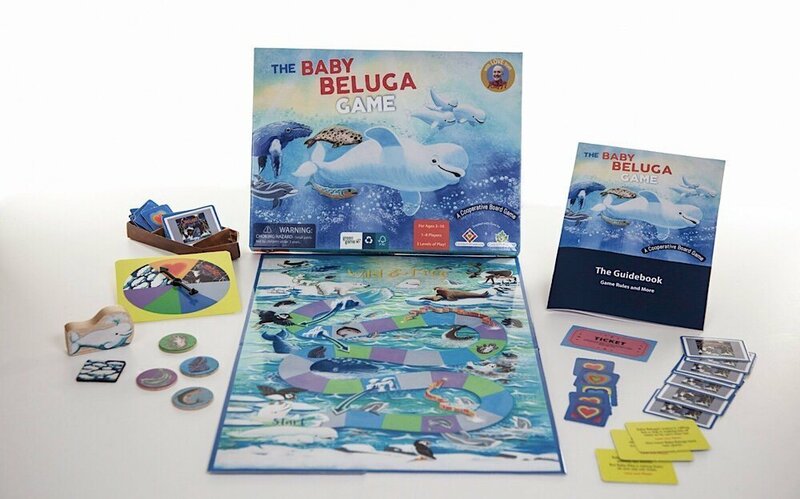 “The Baby Beluga Game” is a new release by CooperativeGames.com, a company that concentrates on games that inspire cooperative strategies. Based on the song of the same name by songwriter Raffi, The Baby Beluga Game features paintings by Ashley Wolff, who illustrated Raffi’s “Baby Beluga” book. 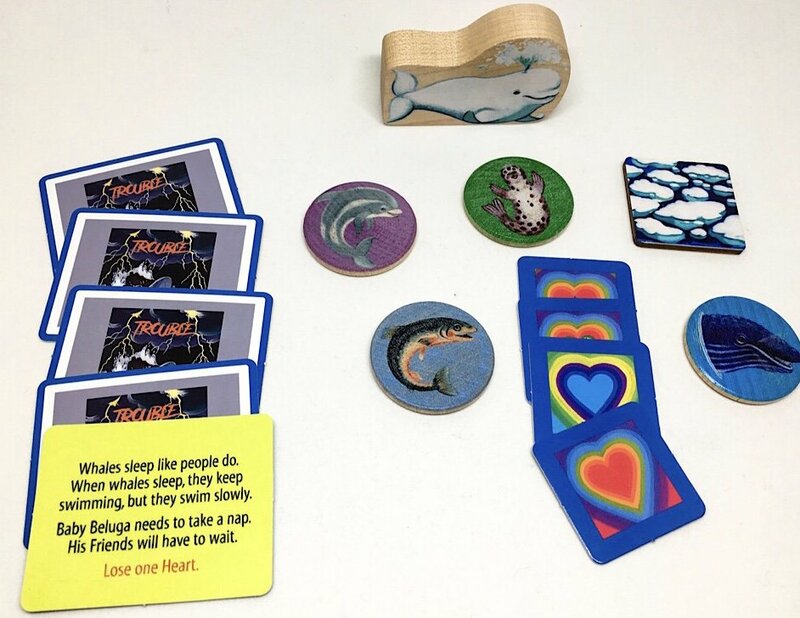 The game also comes with a free download of the “Baby Beluga” song and a 32-page illustrated booklet with info on cooperative play, directions to active games, and tips for using the game in education. CooperativeGames.com is a small business located in California, owned by educator and game designer Suzanne Lyons. The company’s mission is to inspire kids to get together for fun collaboration, sharing and kindness to win as a group while playing cooperatively. 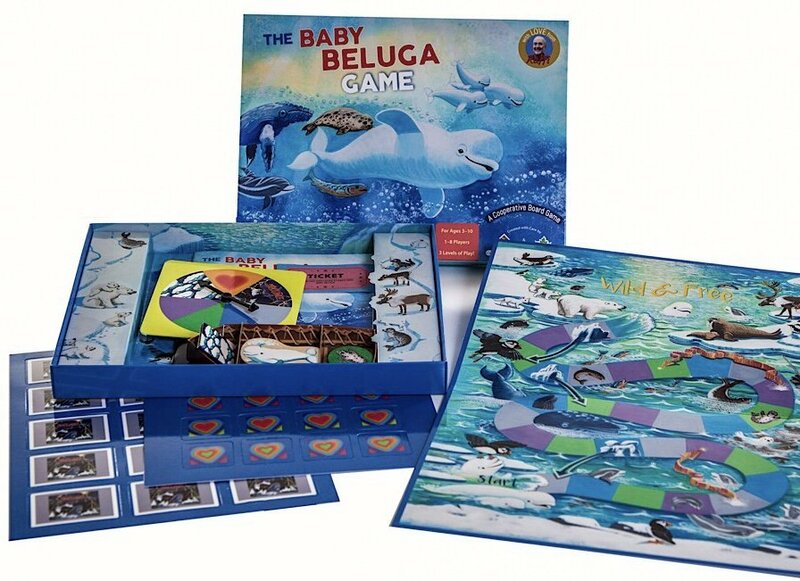 Intended for ages three and older, The Baby Beluga Game retails for $34.95. It’s made in the USA from Earth-friendly materials. Educational benefits include STEM learning, as kids find out about whales and ocean science in a fun way. Plenty of thought went into every aspect of the game and its contents. There’s even a little canoe to hold game pieces and keep them organized between play times! Game inventor Suzanne Lyons recently discussed her inspiration to create this game and the processes behind it via an exclusive interview. The Baby Beluga Games features a gorgeous board. Meagan Meehan (MM): “Baby Beluga Game” is truly a beautiful game that was inspired by a song by children’s songwriter Raffi. So, when did you first hear the song? Suzanne Lyons (SL): I first heard “Baby Beluga” when my children were little, 20 years ago. MM: Did you have plans to create a board game prior to hearing the song or was the song the basis of the very idea? SL: I wanted to create a cooperative board game based on Baby Beluga when I started CooperativeGames.com about 10 years ago. Whales are very cooperative animals so I thought Baby Beluga would be the perfect mascot for playing together cooperatively. MM: How did you get Raffi and the illustrator of the gorgeous imagery on board? SL: I met Raffi when he endorsed my book “The Cooperative Games Bullying Prevention Program” in 2015. He cares about kids a lot and wanted to help out. Raffi and I both wanted Ashley Wolff to illustrate The Baby Beluga Game since she illustrated the original children’s book 30 years ago. Luckily, Ashley was ready, willing, and able to share her talents once more. MM: This game contains a lot of educational content, including an awesome instruction manual that gives details about many species. How long did it take to sort through these details? SL: I’m an educator by training—I was a classroom science teacher, I’ve been a developer of educational materials, and I co-authored the textbook program Conceptual Integrated Science. So, education is second nature to me by now and I couldn’t help but teach a little age-appropriate science through The Baby Beluga Game. Besides science, I’m really interested in social-emotional learning, so I wanted The Baby Beluga Game to engage the heart as well as the mind. The Baby Beluga Game took about two years to develop. That’s partly because, yes, it did take extra time to make it scientifically accurate in every detail. 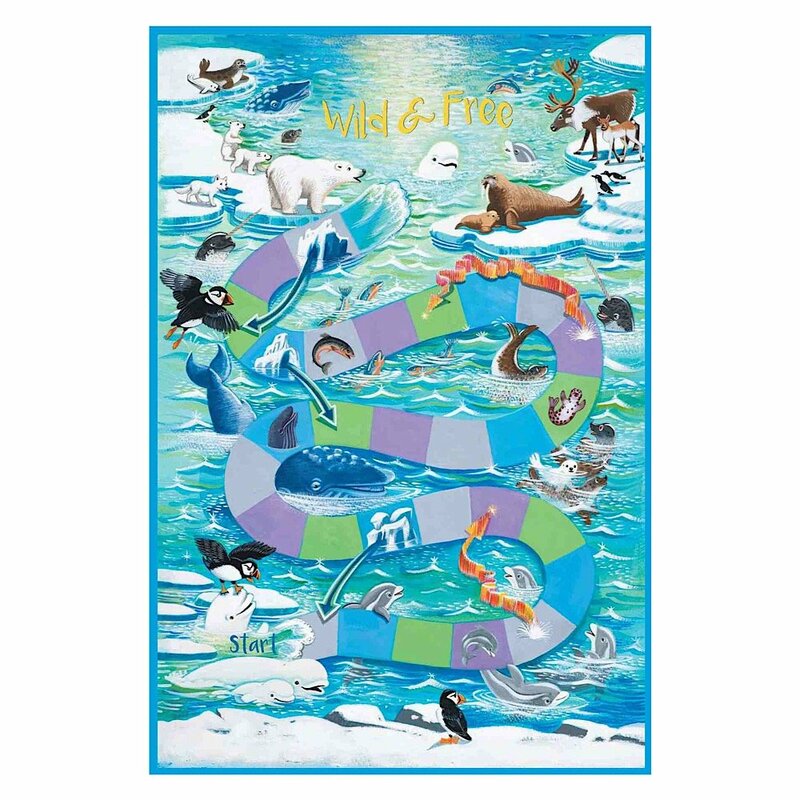 I should mention that the game represents the social habits of the animals in the game setting—even their temperaments such as empathy in the case of Beluga whales and playfulness in dolphins. Recent science sheds light on temperaments of various animals so the scientific accuracy of the game goes beyond details of physical form and natural habitat. Kids don’t have to expend effort learning science when they play the game though. Games need to be fun! The game is simple to play and players can pick up science info over time by osmosis. But for parents and teachers who want to share the science in an intentional way, I included the “Science Pages” in the game guidebook. MM: The game also contains many bits and pieces that are highly detailed and truly lovely to behold. Was it tough to get the design aspects of all of those things sorted out? SL: It wasn’t tough because of the talents and dedication of the people involved in the project. But yes, we did have to be tenacious and stick with it till we all felt everything was right. Raffi and his colleagues Bert and Kim provided overall guidance and much insight about how Baby Beluga should be represented. Ashley Wolff, as already mentioned, is a superb artist and she worked hard incorporating everyone’s suggestions while providing her own ineffable magic. Our graphic designer Dina Clark created a fresh and colorful design and tied the visual elements together harmoniously. Ross Newport, of Community Printers, came up with numerous clever innovations for the game box and supervised the actual fabrication of the game. Finally, our wooden game pieces are made by a small company in Vermont from sustainably managed New England forests, and they are expertly crafted. The quality of the game has a lot to do with the fact that the entire thing is made in the USA. I don’t think it’s possible to make a product as finely crafted and innovative as The Baby Beluga Game overseas. It just requires too much intricate collaboration, spontaneous brainstorming, and shared visioning to do via long-distance relationships. Fair-trade and environmental sustainability are hugely important to us as they are too many other people. We just didn’t want to compromise on that so our entire supply chain is Made in the USA. So far, people have really supported that. SL: We went through about 10 prototypes. The first prototype was much different than the last—it amounted to a completely different game. MM: What were the challenges of getting the game produced and how did you come to work with Cooperative Games? SL: There were many practical challenges because my company is tiny and I am new to manufacturing. There was so much to learn. As I said, I’m an educator by training. I got involved with cooperative games about ten years ago as a public service. I learned about cooperative games from a European friend who was doing pioneering work in the field. The games were less well-known then, and due to their social and educational value, I thought the genre needed an advocate. I wanted the public to discover the value of “playing with one another, not against each other” so I started CooperativeGames.com mainly to help parents and teachers. Now ten years later, the genre has really blossomed. That initial “passion project” has become a part of a diverse, large, and growing movement. SL: I am especially touched by the support from Dr. Toy, who named The Baby Beluga Game one of the Ten Best Educational Products of 2018. Dr. Toy (aka Stevanne Auerbach PhD) has such a long career helping parents and teachers understand the role of toys and games in child development. Children learn through play, so toys and games are important. Dr. Toy has been making that point—in a fun way of course—for decades. She’s a practical idealist and very inspiring. MM: Overall, what are your biggest goals for the future of The Baby Beluga Game and your career as a game designer? For instance, might you create another game based on a song by Raffi? SL: Yes, I just might create another game (or more) with Raffi. For Baby Beluga, I would love to see the game used in the schools so children from all kinds of backgrounds can play it. SL: Well-designed cooperative games can help children learn to cooperate and get along together. If Baby Beluga were real, I think he’d enjoy his new role spreading the spirit of cooperation. To learn more about the game, see here. To hear more about my company, see here. The game is fun, cute and educational.